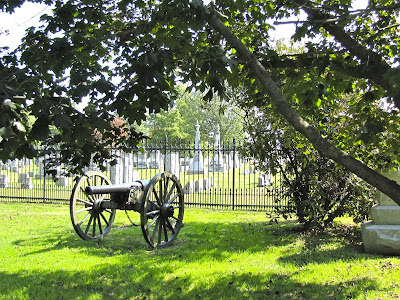 Gettysburg Cemetery. Photo © by Judy Wells. Did you grow up in the era when summer vacation meant being taken to historic sites to "see America"? And was your nose, like mine, stuck in a comic book? Today it's Game Boys or I-Pads but the result is the same: Frustrated parents railing about ungrateful children and children whining about being force marched through dull fields and old buildings for reasons they didn't understand. 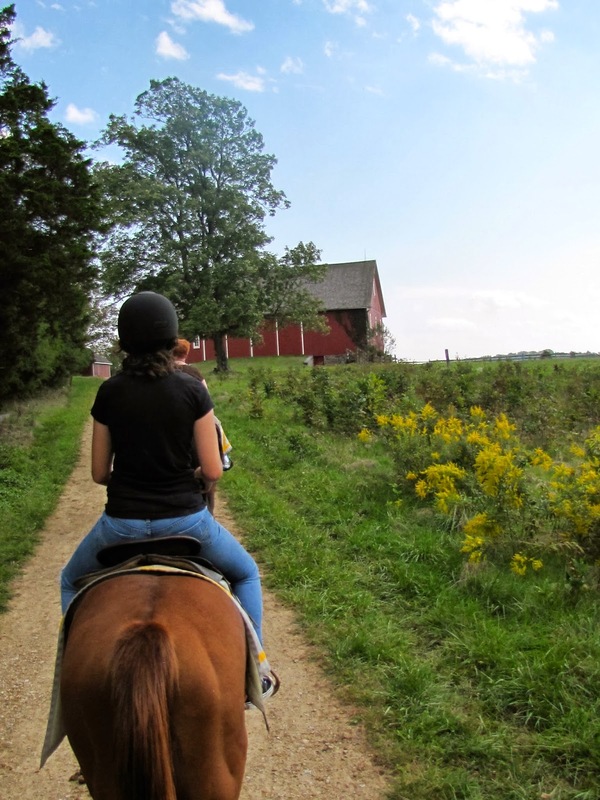 Put those ungrateful, frustrated little wretches atop a horse, though, and it becomes an adventure. Put yourself on one and understand the greatest battle of the Civil War. What occurred there sinks in, too. Virginia's monument to Robert E. Lee and the troops he led. Photo © by Judy Wells. A visit to Gettysburg is an emotional experience but it can be tough for us Levelers. There's a lot of walking - 6,000+ acres, 1,300+ monuments - and changes of elevation. There are tours by bus, bicycle, car, Segway or my favorite. 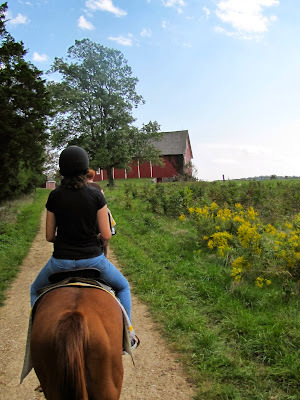 Tip: Get thee to a horse. The beginning of a ride the battle from the Southern side. Photo © by Judy Wells. The importance of the Battle of Gettysburg, the terrible waste of life, the Emancipation Proclamation that followed 150 years ago today make it easy to understand why this is hallowed ground. But no amount of books, maps and documentaries made what actually happened clear to me until I literally "rode the battle". Southern troops spread across a farmer's fields - no shade or water. Photo © by Judy Wells. I learned and understood more in an hour than I had in a lifetime. It's still farmland and the farmhouse is still there. Photo © by Judy Wells. 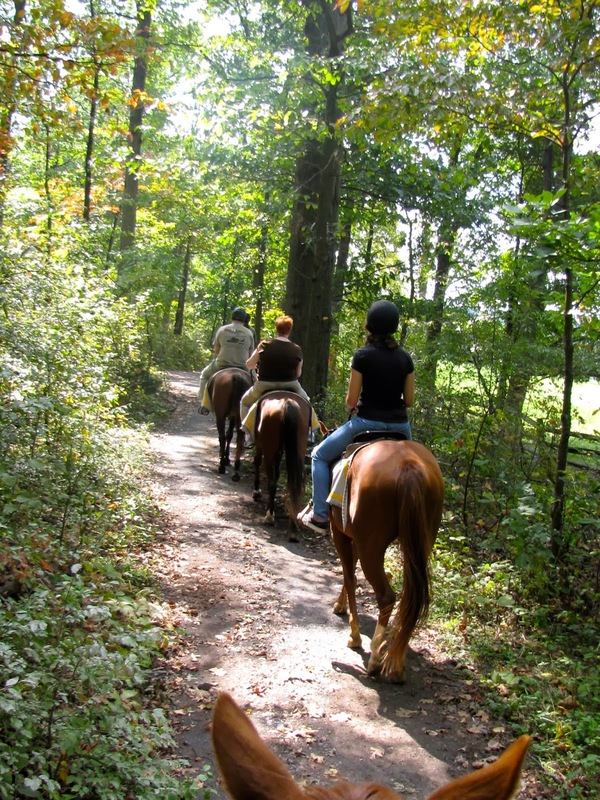 There are horseback tours from the Southern and the Northern sides. Mine was from the Southern side and I heartily recommend it. You can drive up to the Northern positions and easily appreciate their superior ground. The barn from a neighboring farm is still there, too. Photo © by Judy Wells. Don't worry if you can't ride; the horses are gentle and it's a nose to tail, walk and talk pace. You won't be mounted long enough to get sore. Once the Southern troops left a thin line of trees they were in the open with little cover. Photo © by Judy Wells. You'll be able to hear what the accompanying guide says because you'll be wearing ear buds and one of those little clip-on battery operated receivers. Northern troops held the high ground. Photo © by Judy Wells. Speaking of guides, you can opt for ordinary, a costumed General Robert E. Lee or the whole group to be in period costumes. Ordinary, the least expensive, was just fine, thank you. I can imagine how uncomfortable woolen uniforms would have been on those three hot July days. Aptly named Cemetery Ridge was perfect cover for snipers. Photo © by Judy Wells. Those licensed guides/rangers, by the way, study for years and are rigorously tested on their knowledge of the battle and the times. 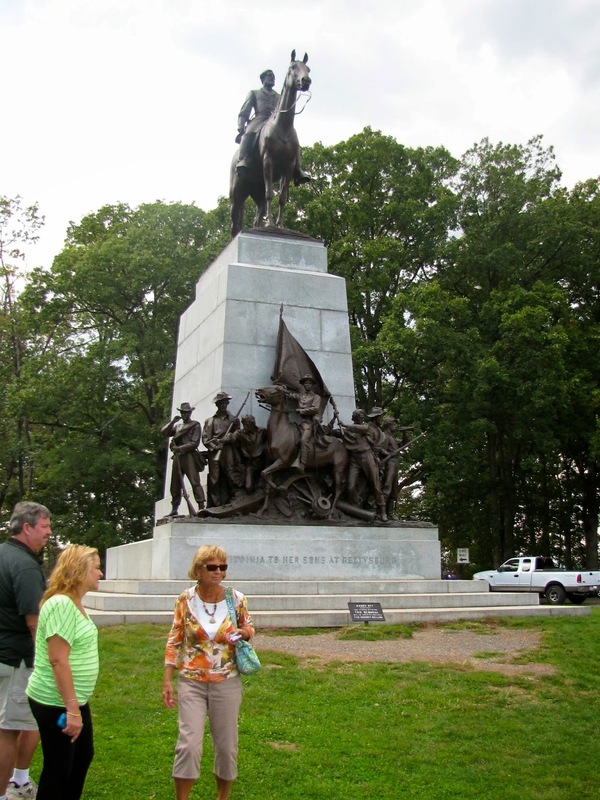 It's easier to get a PhD from an Ivy League college than to become a guide at Gettysburg. The result: the Union was saved and the Emancipation Proclamation could be signed into law at a cost to both sides of 51,000 casualties among the 170,000 men and 5,000 dead horses. Photo © by Judy Wells. Sunrise from the Southern Belle. Photo© by Judy Wells. Resort lovers who want to be able to make a quick run to a McDonald's or Starbucks head north to Nags Head and Duck when they reach North Carolina's Outer Banks. 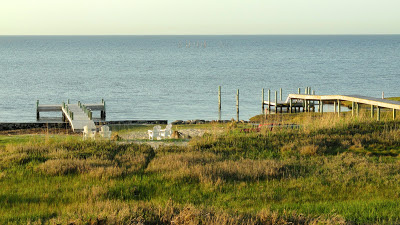 Those seeking a get-away with local color and new experiences turn south toward Bodie Island, Rodanthe, Avon, Frisco and Cape Hatteras. Locals down here brag that you have to drive 45 miles to reach those Golden Arches. "You got to get used to this place," said tour guide Danny Couch, a 10th generation Carolinian who married into island life. "It's not like it is at home." You can find Wi-Fi connections, but no chain restaurants, hardly a sacrifice with a plethora of home-owned, home-sourced cafes and restaurants. Lots of things to do and see, too, if looking at, walking along and swimming in the ocean isn't entertaining enough. Leveler tip #1: Get an elevator. These are among the smaller beach houses. Photo © by Judy Wells. It isn't a luxury. Forget cozy little one-story beach houses. 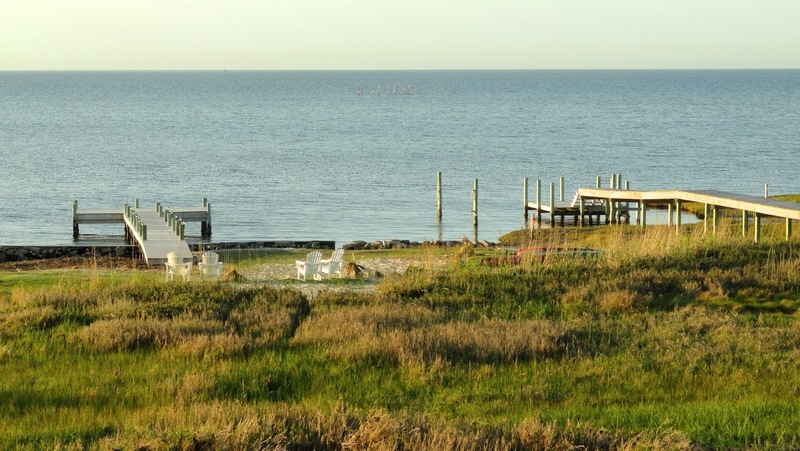 If you want oceanfront - and who doesn't - McMansions are the rule. These pastel-hued two-, three-, four- and more-story belles of the beach are designed for group gatherings. A week at the beach rental destination with three to six bedrooms, large porches, viewful turrets, entertainment systems, elaborately outfitted kitchens and, if the owners are smart, an elevator. First floors are for tucking in the car and letting the Atlantic roll through. Second floors are usually all bedrooms and baths and living spaces begin on three. That's a lot of schlepping up stairs. The Southern Belle - 23 steps up to the second floor. Photo © by Judy Wells. 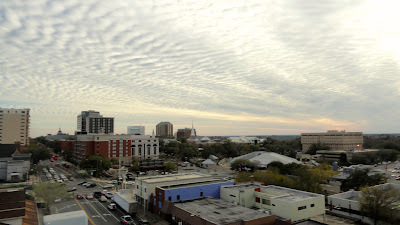 The Southern Belle, where we five journalists stayed, came with a 3-person-sized elevator, a good thing when there are 23 steps up to the second floor. Trust me, you'll want one. Leveler tip #2: Plot your access to the beach. You may have a long walk plus stairs to reach the beach. Photo © by Judy Wells. If you snag beachfront accommodations, plan on negotiating stairs. The dunes developed in the 1930s and '50s have grown and it can be a long walk to reach the stairways down to beach level. It's legal to drive on the beach. Ramps at mile marker (Outer Banks method to relay locations) 49 and 23 are recommended. Easy-walk beach access. Photo © by Judy Wells. The only level place to park and walk to the beach is in Avon between Koru Village Beach Club and the Avon Pier. Leveler tip #3: Eat local. Look for the "Outer Banks Catch" sticker on the door of restaurants to ensure they're serving fresh, local catch. Leveler tip #4: Getting connected. The Dancing Turtle. Photo © by Judy Wells. 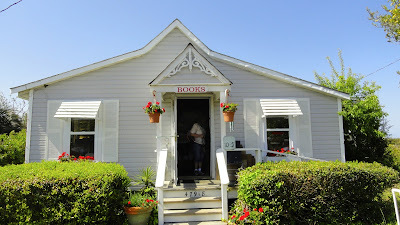 If your rental doesn't have Wi-Fi and you feel the need for connection, make a beeline for The Dancing Turtle Coffee Shop in Hatteras Village. They have that plus good coffees and teas, enticing pastries, comfy chairs and tables and a warm camaraderie. Leveler tip #5: Need groceries? The Food Lion in Avon is the only major grocery store in the southern Outer Banks. Leveler tip #6: Speak like a native. Leveler tip #7: Be friendly OBX native-style. When driving along the two-lane road that runs down the island, "chuck a howdy" - a casual one- or two-finger wave with a nod of your head - to cars you meet. Next: where to eat and what to see and do on the Outer Banks.